Last night we Orlando yogi's took Universal Halloween Horror nights by storm. It was a fun filled night with lots of scares and laughs. I am not sure exactly why getting scared became a fun thing, but I also think it is a necessary thing to learn and be comfortable with. I loved getting scared last night. When we face our fears we are able to tackle on new experiences. We need fear to help us grow. We probably grow most when we push ourselves to the limit of our fears. Maybe you have never done a handstand. Maybe you have been doing handstand for years. At one point you were like me. When I try to jump up into handstand I have a giant fear that I am going to flip my legs over frontwards and land on the person in front of me. This fear causes me to not bring my legs always up in order to ease this fear. At one point of my practice I had the same fear in headstand. I remember feeling that when I crashed it was hard and loud. I never had a graceful fall forward. I continued to fear the headstand until one day...I just did it. There was no magic secret on how it was done. 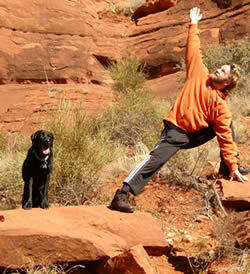 I just came every day, practiced, and practice, and eventually found that I was no longer fearing the headstand. I just was doing it. I do notice that after my headstand felt comfortable, I seemed to shift my fear to the handstand. I wonder if we have a set amount of fear in our lives and we just shift it from one thing to the next? Or do we minimize our fears and hope to grow towards a life with no fear. What else in life am I currently letting my fear win? Maybe it's time we look into our fears and face them. Would life be better without fear? Or would we just become lazy, because we have nothing to fear? Does it make sense to say "Not to fear, fear?" Can we just accept that we fear some parts of life? If we see these fears, do you think it is important to face them? What is your fear today? It is late tonight, and I am tired. 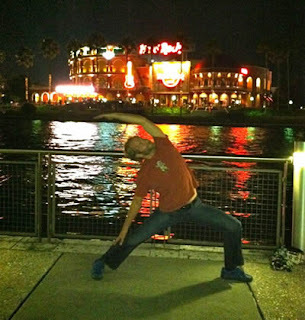 I did go to Yin class with Steve Rubin at Orlando Power Yoga. Now I must go to bed, Sorry if this see,s a bit short tonight, but I do not "fear" what you guys are going to say. Good night.